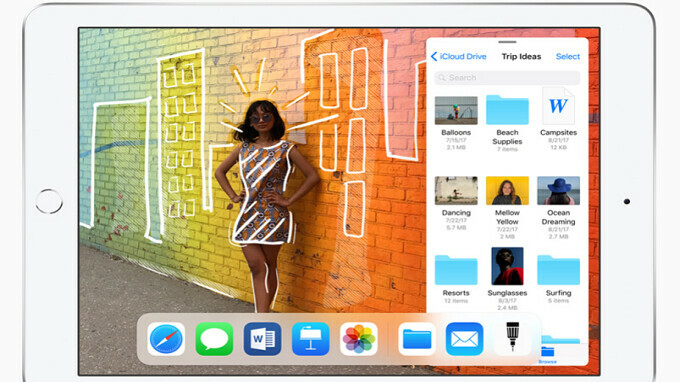 As we told you earlier today, Apple has taken the wraps of its newly updated 9.7-inch iPad. The screen features a resolution of 1536 x 2048, and under the hood is 2016's A10 Fusion chipset, which is a bump up from the A9 SoC powering last year's 9.7-inch model. The biggest change is that the new iPad carries support for the Apple Pencil. It also features an 8MP rear-facing camera and a front-facing FaceTime HD camera. The slate includes Touch ID (you can stare at the tablet for hours, but it won't unlock) and Apple says it will run for 10 hours on a single charge. This afternoon, a tweet from T-Mobile president and CEO John Legere revealed that the carrier will be offering the new Apple iPad sixth generation, as the device is officially called. While the tweet didn't contain any other information, Apple has already released pricing details. The Wi-Fi only model with 32GB of storage will be priced at $329 ($299 for schools), while the 128GB slate will set you back $429. The Wi-Fi + Cellular models will cost $459 for 32GB of storage, and $559 for the 128GB tablet. The Apple Pencil does not come with the tablet out of the box, and requires a separate $99 purchase ($89 for schools). Legere says that more details will be coming. Considering that T-Mobile sold last year's model for $27.99 down and $18 per month for 24 months ($459.99 full retail price), T-Mobile customers should probably expect something similar for the new 9.7-inch Apple iPad (2018). Its almost exactly the same as last years model! It has a new processor and pencil support, that costs an additional $99. Greedy Apple of course doesn't include the pencil with it. Just like with the $1000 Iphone X and they don't even include the fast charger. Many are dropping the stylus from the box these days. My original Surface Book came with the stylus, so when I sold it I included the stylus. When I picked up my 15" Surface Book 2, there wasn't any stylus in the box. It was another $100 too. When I got my iPad Pro 10.5", I was lucky enough to get a deal on the pencil for $85 at least. Only my Samsung Chromebook Pro came with the stylus. Before I picked up the Surface Book 2, I was looking at Lenovo, Dell, Samsung, HP and any other 2-in-1 I could find. Most didn't come with the Stylus, or had a stylus included in one certain model that cost more anyway. Only Samsung came with the stylus on all their models that supported it.